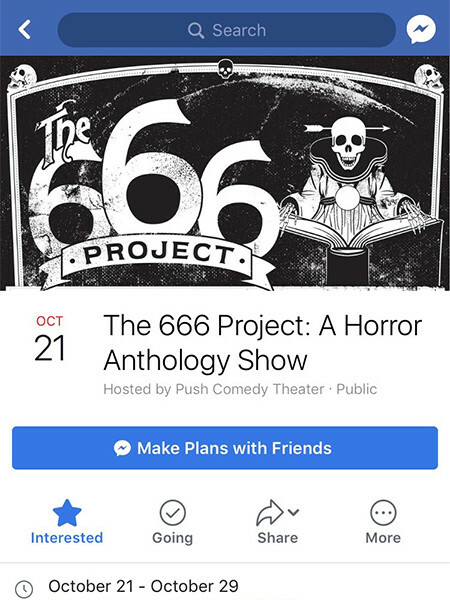 The 666 Project is an annual Halloween show at The Push Comedy Theater in Norfolk, VA. Every year scripts from six writers are chosen, then handed to six directors, and finally performed by only six actors. This show continues the rich tradition of combining two genres: comedy and horror. Black, white, and scary all over. 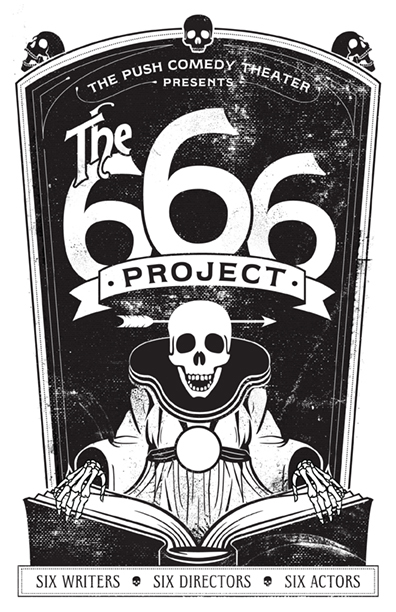 Reaching back and looking at old book covers and occult ephemera, the main skeleton illustration for The 666 Project was born. The overall image recalls grindhouse posters and cheap, old paperback novels. A slight nod to Steve Martin was added to keep everything grounded in humor. Following the illustration, the logo/wordmark developed from a combination of found re-drawn words (THE), lettering (666), and a previously developed custom typeface (PROJECT). The interior layout features Baskerville and another custom, previously developed typeface.